"Since the 1990s, some 20 million tonnes of industrial waste have been buried in this landfill site," said Futuris correspondent Julian Lopez Gomez, reporting from Houthalen-Helchteren in northeast Belgium. "It's a huge ecological challenge but also, maybe, an economic opportunity. Can all this plastic and metal be mined and recycled in efficient, sustainable ways? European scientists are digging deep in a search for answers." The site covers some 230 hectures, with layers of plastic, wood, metal, paper and cardboard lying deep underground. It is rubbish for most people but scientists and waste managers see a treasure trove. "The waste present here represents a huge amount of secondary raw resources and energy which we can recover from the historical landfills and inject again into the economy," said Yves Tielemans, Business Unit Manager with Machiels Group. "To do so, we need very innovative technologies so we take the waste out of the landfill and we use advanced sorting technologies to recover the different waste fractions." At an Austrian university, one of these advance technologies is being tested. While it is a challenge for existing commercial equipment to sort out waste from old landfills, given its altered composition and structure, three different sensors on a prototype being trialled at Montanuniversität Leoben are showing impressive results. "Inside landfills, waste is exposed to various influences," explained Waste Management Engineer, Bastian Küppers. "Dust and water alter the surface of buried waste. But in the landfill, the environment can be very alcaline and acidic and this also affects the material. So when the waste is extracted, we adapt algorithms in the sensors in our machine, so it can properly sort out the different materials, while leaving out certain substances." Once sorted, landfill material can be recycled using sophisticated chemical processes. Researchers in Leuven, Belgium, are turning waste into a glass powder that, mixed with sand and other chemical compounds, can help make construction materials like bricks, tiles or pavement slabs. "These products, because they are chemically seen, are completely different. Mechanically seen, they deliver the same properties as ordinary Portland cement contrete. But chemically they are completely different. They can withstand much better acid attacks or high temperatures," said Lukas Arnout, a Materials Engineer at Ku Leuven. Some half a million landfills are scattered around Europe, waiting to be mined, in what researchers say would be a win-win situation for both the economy and the environment. 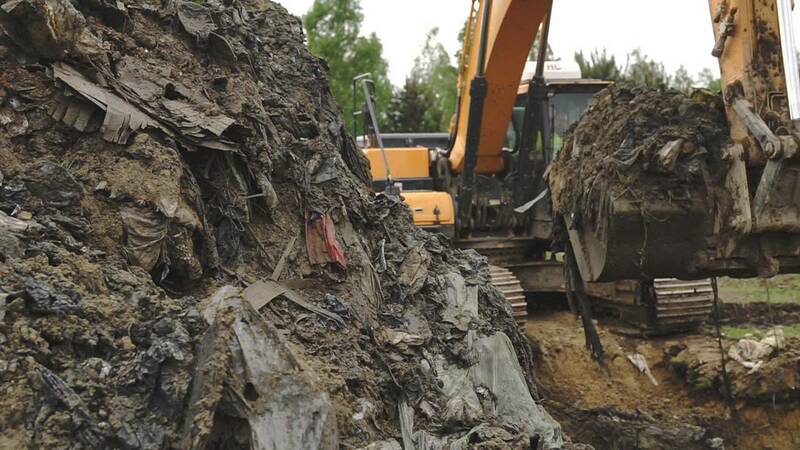 "Every landfill is like a house, a construction, which sooner or later will start showing cracks," explained Ku Leuven Metallurgical Engineer and New-Mine Project Coordinator, Peter Tom Jones. "So sooner or later, water pollution, soil pollution will happen. That also means that sooner or later, any kind of landfill will need some kind of remediation action. That´s why enhanced landfill mining tries to combine the remediation aspect -taking away the pollution source forever - with resource recovery activities." Enhanced landfill mining could become a reality in Europe in less than 10 years, if further legal regulations are quickly put in place.